8TN1600BKF : 9.6 volt 1600mAh NiMH battery with Kyosho (mini Tamiya) connector for Airsoft, RC models. Fits RC racing cars, sport cars, flying models. Fits Airsoft electric Mini AK series, modified AEGs, etc. Length approx. 4.5", width approx. 1.7". Weight approx. 7 ounces (196 gms). YT-12040P is a custom AC Power Supply designed for the OMNI PULSE Charger. It enables you to operate the OMNI PULSE charger from a wall outlet. It plugs into 100-240VAC @ 50-60Hz wall outlets. Output is 12VDC @ 5A max, with a DC socket. NEW UPGRADED SYSTEM: The YT-0006S is a new super Smart Charger/Conditioner system for virtually ALL your rechargeable batteries !! 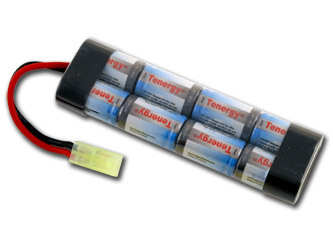 Fully programmable, it smart-charges Li-PO, Ni-Cd, Ni-MH, and Sealed Lead. Includes AC-DC power supply for worldwide use.